Jang Hyun Won plays the hyeo keun. 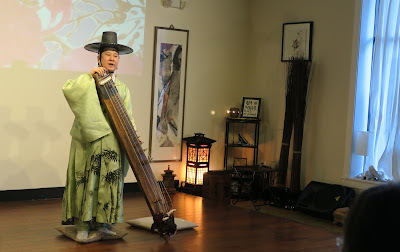 Korean traditional musician Jang Hyun Won gave an incredible performance March 6 at Soricha Tea & Theater in Annandale. 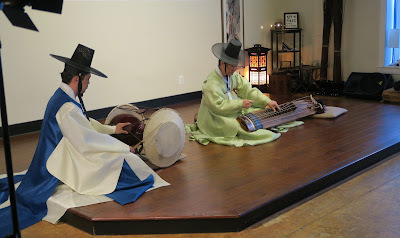 He played original compositions – including some with improvisational elements – on the daegum (a large flute with a haunting sound), an hyeo keun (a stringed instrument known as a black crane zither), and the tae pyeong so (a small double-reed horn). 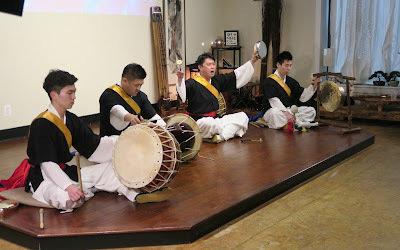 The NY Korean Traditional Marching Band. Jang Hyun Won is considered a “human cultural asset” in Korea, said Min Ji Kim of the Washington Sorichung Institute. His music is said to have healing properties, including the ability to cure depression. 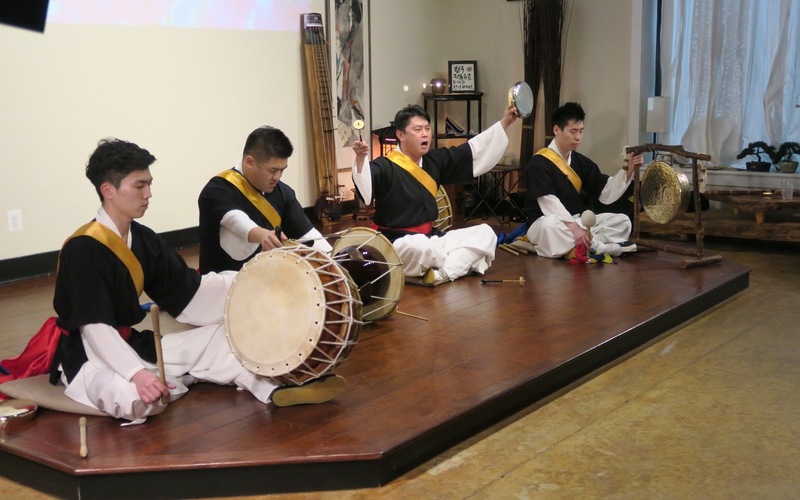 Members of the NY Korean Traditional Marching Band performed high-energy pieces on the janggu, an hourglass-shaped drum, and other percussion instruments. More than 50 people packed into Soricha for the concert. Among them were George Klales who drove from Westchester, Pa., with his friend Russell Dynes from Newark, Del.. They both worked in Korea while in the Peace Corps in the 1970s and “still have great affection for Korean culture,” Dynes said. Thank you for sharing the richness in arts and culture that is Annandale. These talented artists are often unheard and overlooked due to lack of advertising dollars. I applaud the Annandale Blog for making us aware of their presence so we can support and enjoy them with open hearts. Please let us know of any future performances.